Sometimes it is better to be lucky than to be good. That was clearly the situation behind the acquisition of the so-called “Thorne Vase” (as named by David Doty). My wife, Barbara, was an antique dealer for many years. One way to spend quality time together was to attend auctions together, and we attended a lot of them during the 1980s (part of that story was told in “Antique Buying, the Wholesale Myth”, Glass Collector’s Digest, October/November, 1987). We were attending an auction at the Pacific Galleries in downtown Seattle one evening in 1986 when a lot of three carnival glass pieces came up: a large marigold bowl with a fleur de lis pattern and two identical marigold 8 inch vases with a large diamond-in-circle pattern. Both patterns were very heavy, high quality glass. We had started collecting carnival glass, primarily Dragon & Lotus (that story was told in “Carnival Glass, the Anatomy of a Collectible”, Glass Collector’s Digest February/March, 1988). However, we could not identify either pattern, other than probable European origin (Pacific Galleries imported many lots from Europe). We risked a grand total of $45 on the lot and were successful. Over the next few years, we tried to identify the pieces. We showed them to other collectors. We even took them to a glass convention and showed them to Frank Fenton. No one could identify them. Finally, well over a decade later, we took them to the International Carnival Glass Convention in 1999 and showed them to Glen Thistlewood. 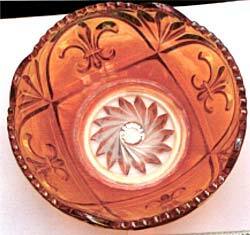 Glen identified the bowl as Fleur De Lis by Inwald, Czechoslovakia. Several other pieces of this pattern have been found subsequently, including bowls, vases, plates and pitchers. However, to my knowledge, the bowl we acquired remains the only known example of the Master Bowl. The vase was more challenging. 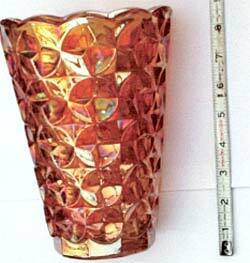 Initially, Glen thought the manufacturer might be Rindskopf, Czechoslovakia, and David Doty notes two examples of a 6 inch version of the vase that were sold in 1999 and 2001. However, recently, Glen discovered the pattern in a Walther-Sacksenglass catalog, where it was named “Luttich.” An example of the 8 inch vase was sold on eBay last March by a seller from the Netherlands. I corresponded with the seller, an experienced glass dealer, and he has seen four examples, three in France and one in Belgium. A couple of years after we acquired the pair, we sold one of them for $30 at an antique show in Seattle. So we got most of our investment back, and there is one more out there somewhere, probably still in the Seattle area.